Start Now! SBCC Startup Method. Want to start? Want help? Just Tweeted @JohnSWren, please RT, TWEET and SHARE, ok? Thanks! This is what trigger the above Tweet! ATTENTION, PEOPLE WHO BELIEVE IN ENTREPRENEURS! John S Wren, MBA+++ Life's short, start now! : New USA Ring of Fame Announced. It's Monday, January 14, 2019. All times Mountain (Denver) Time. Each Day, Startup Show, 10 a.m. It is usually members only, this week everyone can watch live on www.Facebook.com/JohnSWren. Our purpose is to help restore the dynamism and vitalism of the US economy by strengthening the grassroots in business and politics. For more about how we do this "Visit Group" on our Facebook Page https://Facebook.com/Small.Business.Chamber and join us if you haven't already, it's free and fast. Check it out now! More about this each day on Startup Show or call (303)861-1447.
a webmaster, board members, exec director. Please share with any Catholic priest who you think might be willing to bless our work, ok? I wish Thomas Merton was still alive, I'd ask him. Fr. James Martin? Fr. Richard Rohr? Or... ? Small Business Chamber of Commerce, Inc. This life is short, start now! We ask all to keep confidential what is shared here, on any of our Internet sites, and in any of our face-to-face meeting. But there is no guarantee of this. Please do not join or share if you think that your membership or share being public could harm you. This policy applies to all communications of John Wren and his various online pages, groups, and websites. Edmund Phelps on Mass Flourishing. Send media releases about news by US Mail to Small Business Chamber, 1881 Buchtel Blvd. #501, Denver, CO 80210 and email copy to John@JohnWren.com with when he should call you for personal interview. John Wren's book and workshop. Want to be guest on Startup Show? To: All who want to be on the Startup Show. ASAP 1) Print this, 2) fill out coupon, 3) send to us by US mail or take digital photo and email, 4) finally call us to let us know what you've done and why you want more information about workig with us. Call (303)861-1447. Click and join us now! No cost, just introduce you/ your business on our Facebook Page. PUBLIC SPEAKING: invite us to talk about startup and business creativity at your next chamber, association, or club meeting. GROUP FACILITATION: let us lead the next meeting in your company when you need fresh, powerful, new ideas. ORGANIZATION AND FACILITATION: IDEA Salons, open discussion groups about startup. IDEA Cafe Startup Workshops. THE STARTUP LINE: (303)861-1447. Help for YOU as you start in a new direction with your career, starting a new project or campaign, or starting a new business. 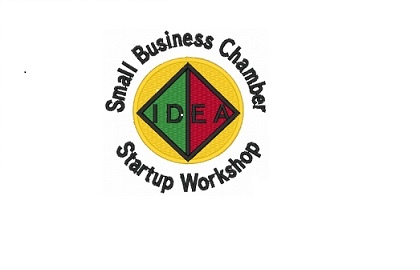 ASSISTANCE FOR LOCAL CHAMBERS and others to start new IDEA Startup Workshops and Franklin Circles. Please call before sending email. The mission of your new, free Small Business Chamber of Commerce (no dues or fees for membership, we intend to be self-supporting through fully disclosed voluntary contributions so the help we provide is available to everyone) is to strengthen the voice of the grassroots in business and politics. 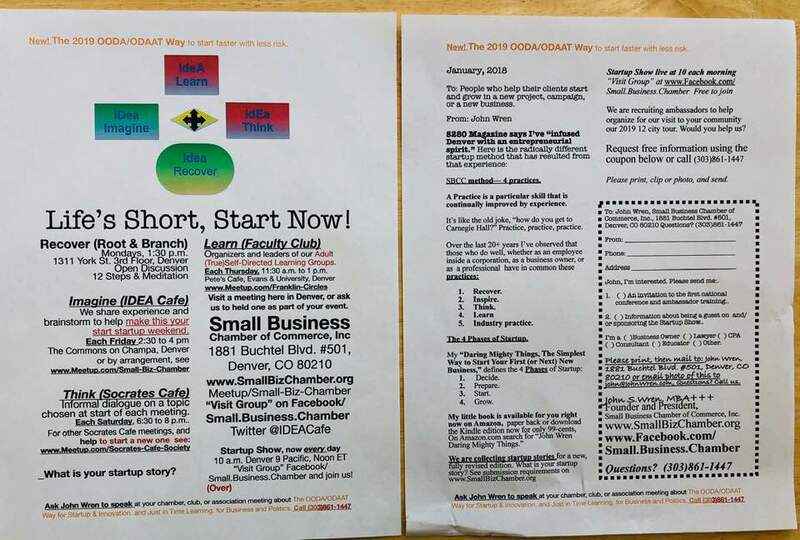 We cooperate with local chambers and other groups to organize low cost/ no cost IDEA Startup Workshops, Franklin Circles (Peer Advisory Groups), and Root & Branch Recovery Faith Sharing Groups. Our purpose is to do Good Work and to help others do Good Work, too. Good Work provides: 1) useful products and services for customers, and 2) for all involved in the business (owners, employees, and suppliers) an adequate income and an opportunity for learning and personal growth, all for the greater glory of our God as we each understand God. For more see E.F. Schumacher's book Small is Beautiful and James Martin's book the Jesuit Guide to (Almost) Everything. Managed by John Wren www.JohnWren.com or (720)495-4949. Powered by Blogger.